Leonora Eames (Barbara Bel Geddes) is a beautiful girl who has moved to the big city to attend finishing school and get a job as an in-store model. Once there, she plans to meet a rich man and get married and leave the single life behind. This happens sooner than expected, and not entirely according to plan, when a creepy shopper invites her to a yacht party hosted by one Smith Ohlrig (Robert Ryan). It's his name that compels Leonora to go to the party, and it's him that she accidentally meets when he sneaks away from his own soiree to go take care of some business. They are married in short order, though Smith takes her hand more to prove a point than out of love. Leonora insists she has genuine affection for him, but that is soon strained. This is the set up of Caught, an intense melodrama from Max Ophüls, the master filmmaker behind such nimbly effective literary-minded films as Lola Montes and The Earrings of Madame de.... 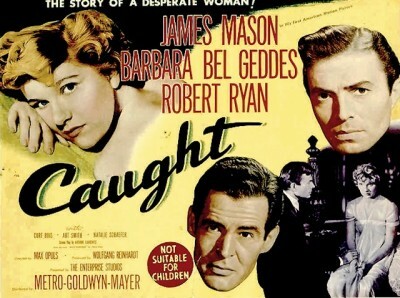 Caught came at the tail-end of the German director's American period, right around the same time as Letter from an Unknown Woman and That Reckless Moment. It's a city-based picture, set in New York, adapting Victorian and gothic romance to moody film noir trends. Leonora's story really gets into gear when she first gets the gumption to leave Smith and strike out on her own. She gets a job as a secretary in a doctor's office, working for an obstetrician and a pediatrician. As the one doc explains, his colleague is responsible for bringing them into this world, whereas he is responsible for making sure they survive it--which he doesn't always succeed at it. It's a practical approach, but Dr. Quinada (James Mason) is a practical man. His inability to tolerate frivolity causes him and Leonora to chafe at first, but as she settles into her position, he becomes used to the idea of her, and they fall in love. Yet, she's still a married woman, a secret she has kept to herself, and added complications mean it would be difficult for them to get together, even if Quinada did know the truth. Smith Ohlrig doesn't let go of his trophies that easily. The dynamic in this love triangle hearkens back to the Brontë's. The good doctor is definitely a Mr. Darcy-type, prickly on the outside, but good at heart. His focus is on his work and on the good he can do, and his loosening up requires some humbling. Mason is spectacular, smoothly moving from being conceited and bullying into sensitive and earnest. His best scenes offer him both a chance at comedy and forceful drama both. In the latter case, it's when he and Robert Ryan's character finally meet. It's a mental standoff, with both men standing on the opposite side of a bar, sizing each other up and taking each other down with words. Ryan has a rather indomitable presence when he's playing a bad guy, and there's some pretty sinister stuff going on here. Ohlrig is a vain abuser, but the actor keeps him from somehow being too over-the-top, letting hidden weaknesses provide nuance. I suppose it says something about Barbara Bel Geddes, then, that Mason's moment of comedy is on his one date with Leonora, and not between him and his lady love. There's an amusing bit of business as a drunken woman continually interrupts their conversation. It works for the story, as it shows how Quinada can't be distracted from what he wants; it works for the movie because it provides a bit of relief from Bel Geddes' milquetoast performance. She's the weak link in her own starring vehicle. Not that it matters much. Ophüls crafts a temperamental narrative, where the road to hell is a two-lane highway: good intentions on one side, selfish impulse on the other. Since the film was released in 1949, it shouldn't be a shock that most everyone gets what they deserve, though Caught avoids being too much of a fairy tale by delivering what is perhaps the most cynical of hopeful endings you're likely to find in cinema. Olive's full-frame 1.37:1 image of Caught is very good. The black-and-white picture certainly looks better than when I watched this film on Netflix a couple of years ago. The resolution is crisp with lots of detail and a fantastic contrast between light and dark, meaning all of cameraman Lee Garmes' carefully arranged shadows appear just as intended, marking the walls and adding sinister atmosphere to some of the more difficult scenes. There are some scracthes and spots here and there on the print but nothing terrible. The mono soundtrack is clear and clean with no glitches or distortion. Highly Recommended. 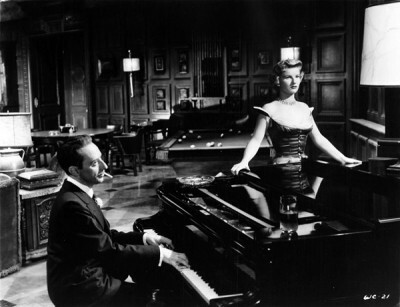 Max Ophüls 1949 romantic melodrama Caught is a bit of a mash-up of Rebecca and the prevailing film noir style, casting threatening shadows over one woman's search for happiness amongst two domineering men. 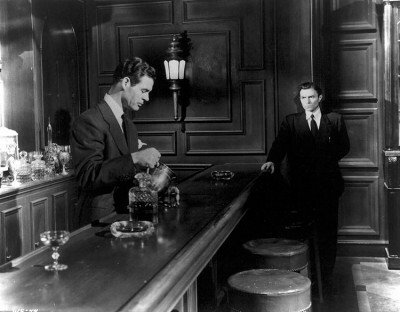 Robert Ryan plays the abusive rich husband, and he is offset by James Mason as the impassioned doctor with tunnel vision. The tug-of-war for the lady's affections touches on some very dark topics, and the bad things that Ryan does to his bride are very bad indeed, making for a disarming, potent tale about the extreme vagaries of the heart.